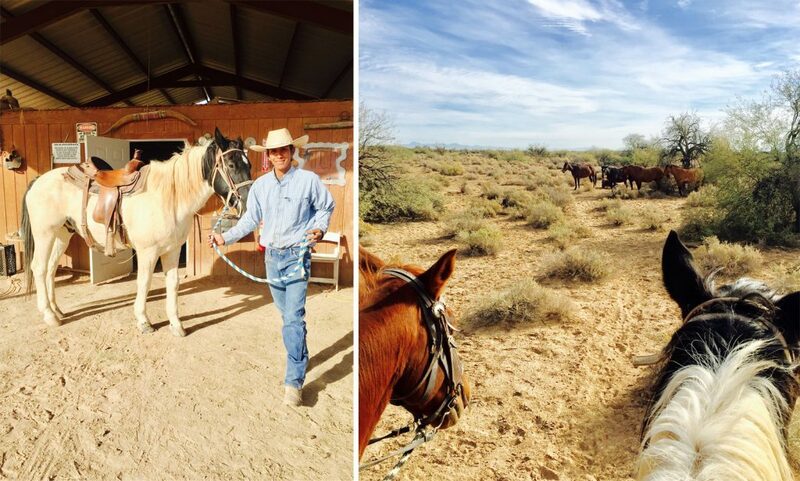 In a wide-brimmed brown hat, closed-toe shoes and long jeans despite the heat, I’m high on my horse, literally, heading out into the Sonoran Desert just 30 minutes south of Phoenix, Arizona. The sky is a deep, cloudless blue on this November morning. Guide Robert Pablo, a wrangler at Koli Equestrian Centre, leads the way; my husband rides behind. We’re at Wild Horse Pass in the Gila River Indian Community, guests at the nearby Sheraton Grand resort on this Native American-owned property. We’d heard that you can sometimes see the wild horses for which the area is named from the Sheraton itself, a telltale cloud of dust marking the spot in the distance. But if you’re up for it, you can attempt to see them up close by taking a trail ride. Hundreds of horses are said to roam these dry scrublands, but the pass is so huge it’s not a given you’ll see them even from horseback. Pablo promises to do his best to help us get a glimpse, but in the meantime, we’re just enjoying the ride. Pablo, who is half Maricopa, half Pima Indian, shares some of his extensive knowledge of his peoples’ lands. “That’s mesquite,” he says, pointing to a stand of squat, ragged-looking trees. “It’ll burn just about forever.” He explains the traditional way to cook meat in the desert, which is to wrap it up and bury it with hot mesquite coals in the sand overnight. A huge jackrabbit bounds past and bolts down a hole. Pablo also points out various birds we otherwise wouldn’t have noticed in the plant life around us. “People think there’s nothing in the desert, but there is plenty of life here,” he says. The Sheraton Grand at Wild Horse Pass sits on a huge piece of the Sonoran, and everything about it is designed to be an authentic representation of the architecture, design, art and oral stories of the Pima (Akimel O’otham) and Maricopa (Pee Posh) tribes. The hotel even employs a cultural manager, Rosie Rivera, to ensure that authenticity is reflected in every detail. Rivera is consulted on many cultural questions including the correct use and spelling of native words on the menus, and she researches local artists for commissioned works that appear throughout the airy, high-ceilinged hotel. 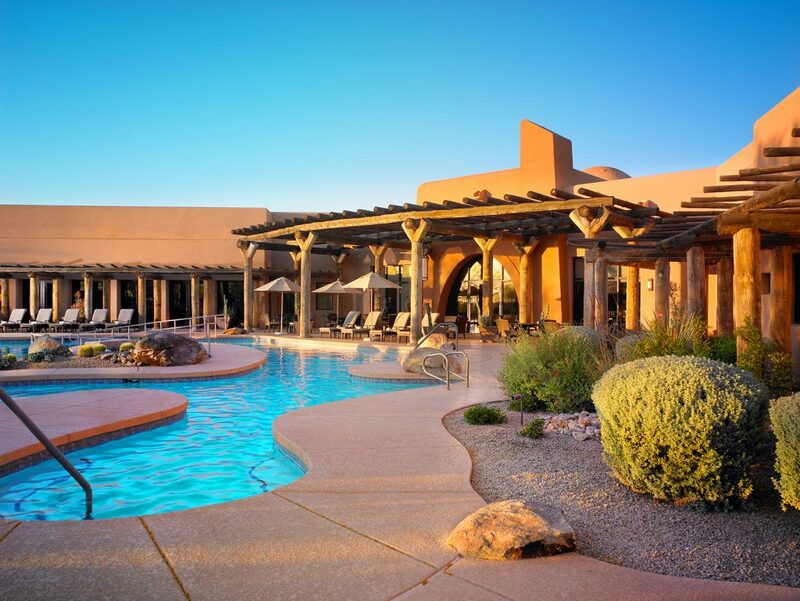 “Part of my role is to ensure the culture and heritage of the Pima and Maricopa tribes are accurately reflected throughout the resort and spa,” explains Rivera, whose mother is Pima from the Gila River Indian Community. Indeed, from the ingredients used in the treatments at Aji Spa to the food at the award-winning Kai restaurant (kai is Pima for “seed”) and the excellent Ko’Sin (“kitchen”) restaurant — you can dine under the starry night sky at both — everything reflects the land and its people. There’s also great golf, beautiful pools and an interpretive nature trail to be had here. But it’s the wild horses that steal the show. We’ve learned a lot on our trail ride, but so far, we haven’t spotted any horses. We’re 45 minutes into our one-hour ride, a quick-paced walk that’s taking us in a large circle, when Pablo says, “Let’s try the watering hole over there.” So we turn our horses to follow him, and as we get closer he silently puts his hand behind him — the signal for whoa. Then we see them, too: about 10 wild horses, most dark brown with black manes, taking shade under some trees. One is rolling on its back in the sand. They spot us creeping forward, and our own steeds seem a little edgy. “Okay, okay,” Pablo says gently, both to his own horses and to those of the land, as we close the distance between us and gaze at each other. We’re now just about six metres apart. The wild ones are all on high alert; those that were lying down have gotten up, and a couple of them are shyly inching towards us. Our horses respond by looking nervously side to side. Then, one of the wild horses whinnies loudly and begins prancing boldly over, and just like that, the encounter ends with Pablo leading us away for our own safety. “They like to show us who’s boss,” he remarks as we back off. I’m happy to stand down, grateful to have come face-to-face with these beautiful wild creatures, if only for a moment.